MailChimp allows you to improve your email marketing, offering the ability to send marketing emails and targeted campaigns. 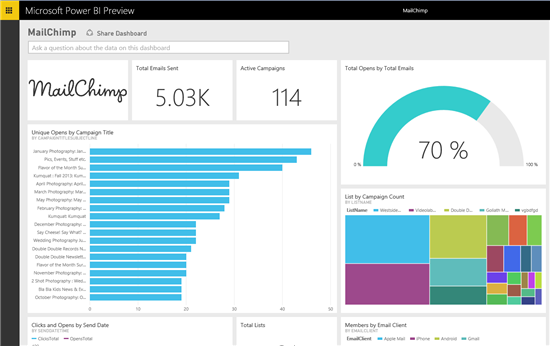 Power BI allows you to monitor and explore that data using the MailChimp APIs, offering a set of out-of-box content for your analytics. The dashboard, reports and dataset curated for the MailChimp scenario allow you to easily access data such as Top Campaigns of Total Opens by Day of Week. In this post we’ll focus on how the Power BI and MailChimp integration content pack helps you explore and monitor your MailChimp data. 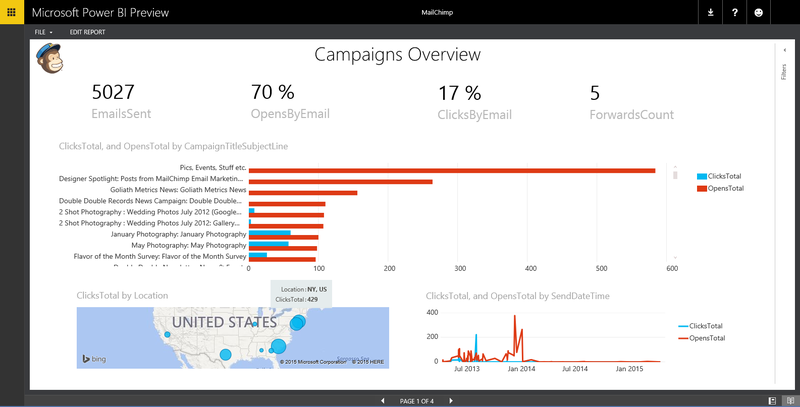 For additional details on how to get started, please see the MailChimp content pack for Power BI. 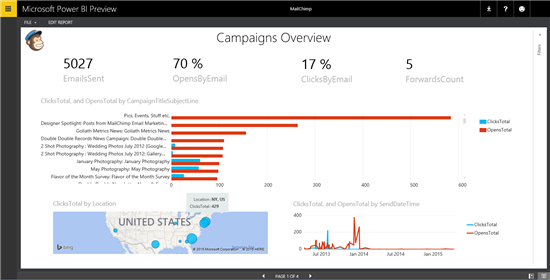 The content pack brings in data from your Campaigns and Lists in MailChimp. 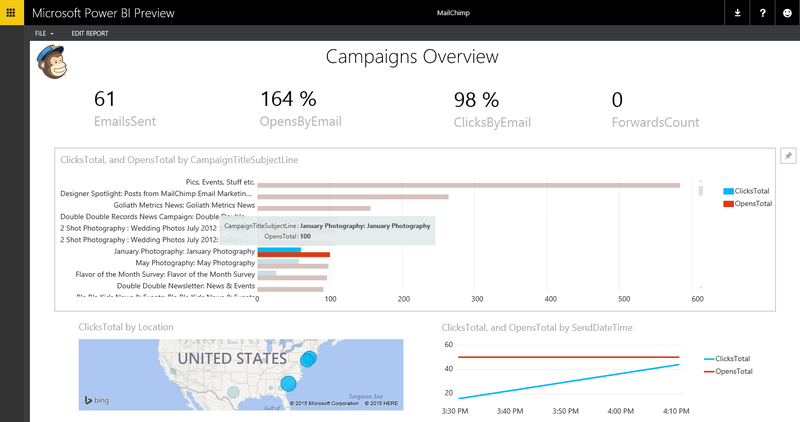 Simply connect through your MailChimp account and provide access to Power BI. A dashboard is automatically created once you’ve provided credentials and given access to Power BI. Each tile includes a specific metric you can monitor from the dashboard view. Select one of the tiles to drill in further to the reports, such as “Total Emails Sent”. This is just one of four pages of reports that are included as part of the out-of-box content: Campaigns Overview, Top Campaigns, Lists Overview and List Members. Different tiles on the dashboard may lead to different report pages. Hovering over any of the items on a report provides more details. You can also select a particular entry, such as product name, to cross filter the other visuals by that selection. For example, selecting the campaign “January Photography” will filter the other visuals, so you can see the totals for that specific campaign, including where it was opened, etc. 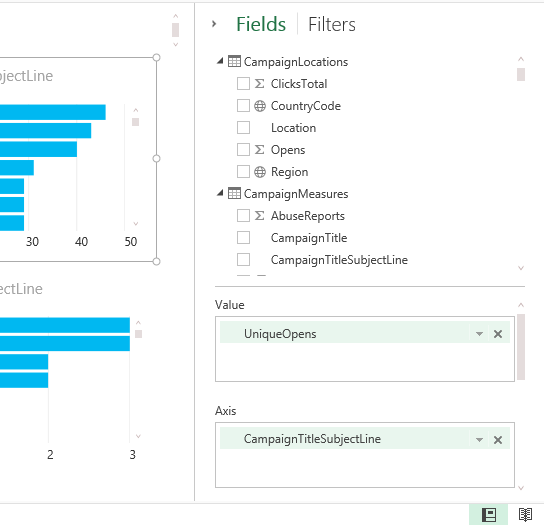 The filter pane allows you to change the slice of data you’re viewing. Pinning visuals will load them to your dashboard. You can fully customize the dashboard to meet your needs, including rearranging and changing the size of the tiles. You can also switch into Edit mode to view all the fields available for your reporting. This allows you to edit or add additional visuals to customize your report and dashboard. You might have also noticed a question box back on your dashboard. This allows you to ask a question of your data, in natural language, and get visual results. Try “Show total emails by campaign title” or “Show total clicks by location on a map”. Those results can also be pinned to your dashboard. The dashboard updates daily, ensuring you’re monitoring the most up-to-date data. This Power BI content pack offers an initial set of metrics and insights; continue to explore your MailChimp data to discover even more.